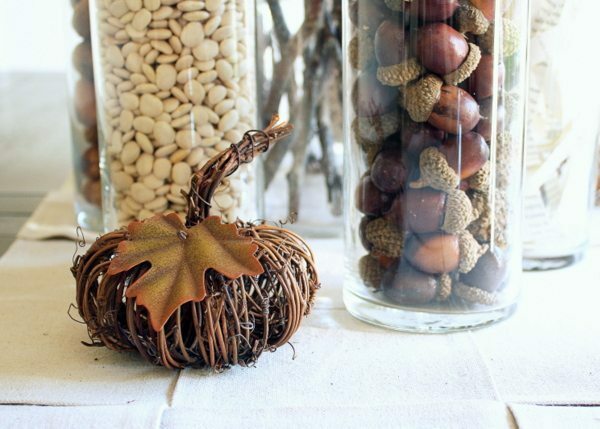 For me, fall decor is all about the usage of natural elements and incorporating a variety of natural textures. Living in the Pacific Northwest I so blessed to be surrounded by beautiful mountains and trees and some of the most beautiful scenery you can imagine. I wake up looking at the Cascade Mountains and at night I watch the sunset over the wheat fields. I love it here. This time of year I’m especially grateful for where I live because I can find beautiful things to decorate with in my own backyard. 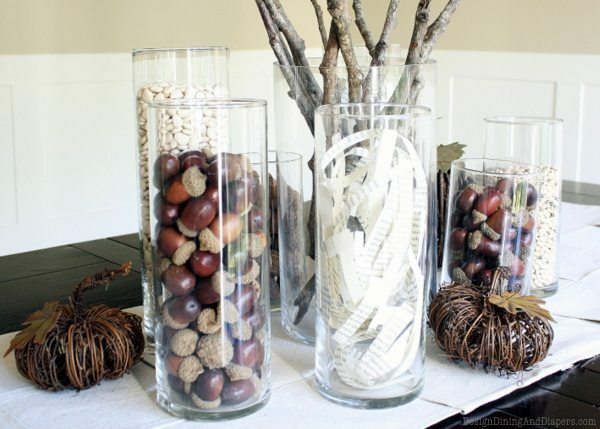 Instead of putting together a complete fall tablescape this year, I’m showing you a simplistic and rustic centerpiece I put together for our everyday table. As much as I love the traditional deep reds and oranges, I wanted to create something clean, rustic and neutral for our space. Something that is true to my style. I used cylinder vases in varying heights to create the focal point on the table and filled them with different natural elements. I filled the vases with shredded book pages, branches, black-eyed peas, Lima beans, acorns, and walnuts. They all bring different textures and colors to the table but remain cohesive. I love these little grapevine pumpkins I picked up a few years back. I love how versatile they are, I’ve used them in so many different ways over the years. I made the woven table runner out of canvas drop cloth. It was an easy afternoon project and something that can be used year round! I love fall and I cannot wait to see what this new season brings. I really like the paper strips, good idea! Simple, natural, and simply stunning, Taryn! 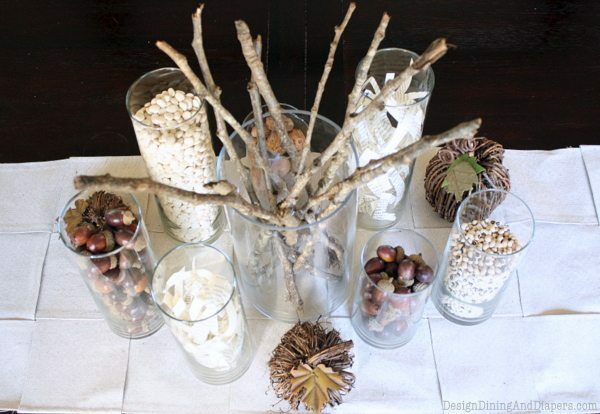 Don’t you love using natural elements for fall decorating? I remarked to my readers that nature is the best arts & crafts store. I’m very impressed with your canvas drop cloth runner- super clever. Great look! These are just lovely! I’m so glad to see something a little ‘different’. I enjoy neutrals using different textures as well. Love the runner too! 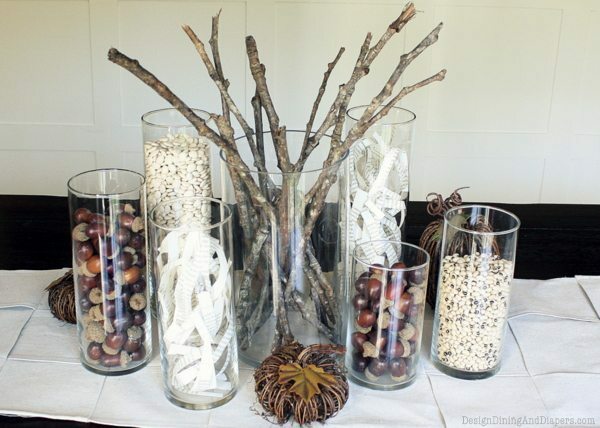 Your centerpiece looks gorgeous!! It always takes me forever to get mine right, and by then? The season or holiday is usually over or ending soon. Ha! Visiting from Southern Lovely. Looks great! I really like those grapevine pumpkins! I love all the different textures. Very cool! This is so pretty and festive. It gets me in the mood for fall and even winter! Oh my- the pumpkin, the beans- I’m so loving this. Great ideas Taryn! I love how affordable all of these items are and they make such a statement. So pretty!! I love all the textures! I’ve pinned and I’m sharing on FB now! I just love the shredded paper – it looks so rustic and fall like. 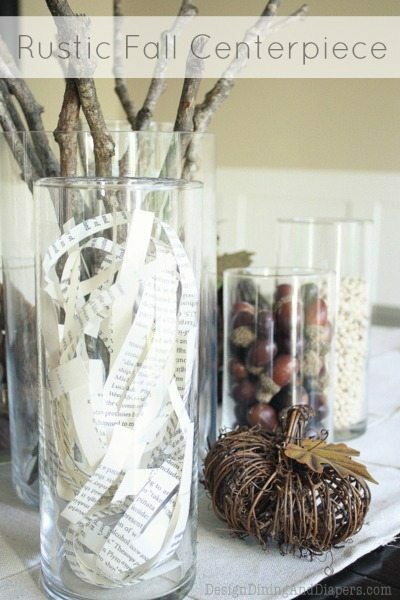 Great centerpiece! Lovely !- gosh the acorns here are much smaller…..and still green. Gorgeous…as always! 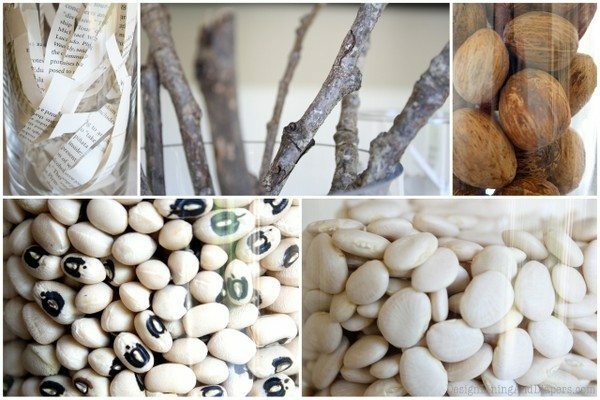 Love the beans and the paper strips are too cool! Love! 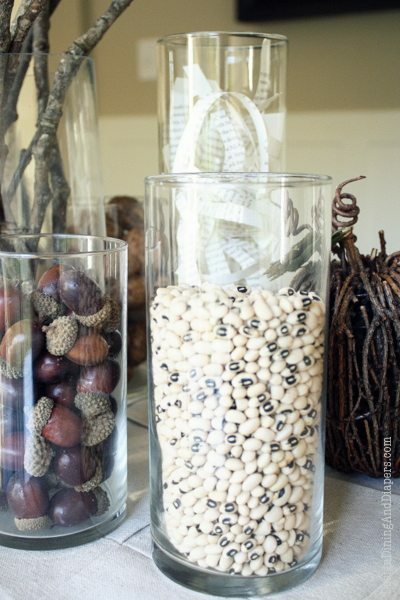 I decorate with beans for every season!! So affordable and pretty, too!